VedicMaths.Org - Newsflash - Two courses start soon in Manchester, England. Two courses start soon in Manchester, England. 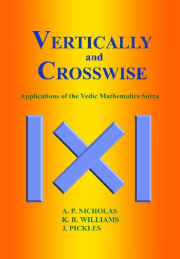 Multiplication and division by, 'Vertically and Crosswise' multiplication of numbers, and multiplication and division of algebra. Four evening classes introducing Vedic Mathematics at Manchester Metropolitan University, Manchester, England in the John Dalton extension. 17th, 24th, 31st January, 14th February 2001. 7 pm - 9 pm. The course will be suitable for anyone with a general interest in mathematics and also for teachers of mathematics at Key Stages 2, 3 and 4. Since the whole emphasis of the Vedic system is different from the outset, participants will be given the opportunity to practice the methods.